Baking from scratch is the perfect way to tell someone that you care about them. Whether is is over the holiday season or just because. 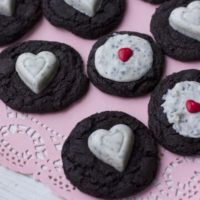 Since Valentine’s Day is quickly approaching I thought I would share yet another yummy Valentine’s Day Recipe that anyone who likes the idea of cookies and creme will be excited about. One of my youngest son’s favorite candy bar is Cookies & Creme. 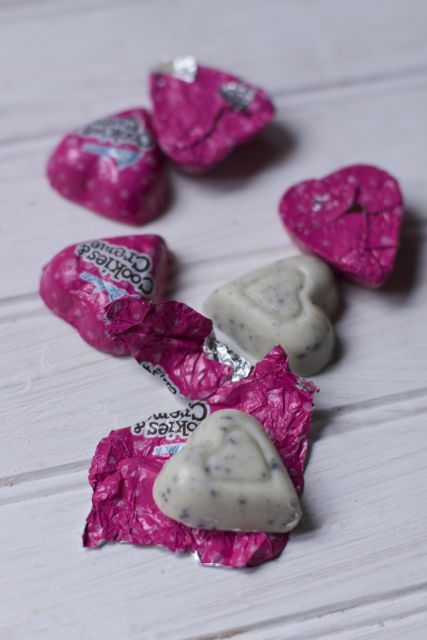 When I saw these adorable cookies & creme, chocolate hearts I could not resist coming up with a fun Valentine’s Day cookie idea. 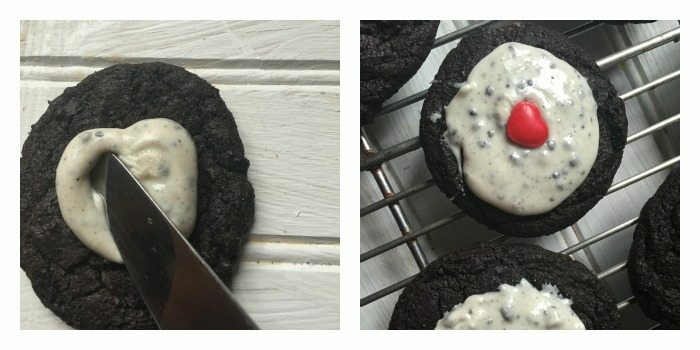 Even if you don’t celebrate Valentine’s Day I share a way to make a cookie frosting with the chocolates. 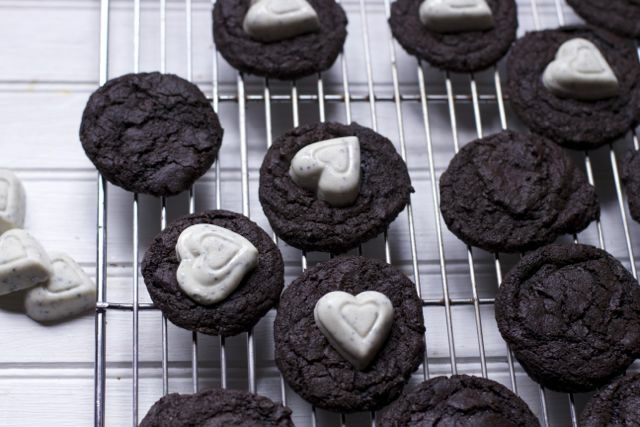 These cookies were so delicious I am thinking I might try and make my own OREO’s one of these days. I found the cookie and creme chocolates at our dollar store but have not looked anywhere else. Be suer to check out the Peanut Butter Kiss Cookies we made using another candy found at the Dollar store. The trick to make these rich chocolate is to use, a dark chocolate cocoa instead of the traditional. I am sure if you only had the regular these would turn out great, just lighter in color. I used a small ice cream scoop which allows you to have identical sized cookies. Plus you don’t get your hands as dirty. I experimented rolling one batch and just dropping the dough for the second half.. I think I like the thickness of the rolled cookies but play with yourself. Allow the cookies to sit for about 30 seconds before placing your chocolate. And DO NOT TOUCH the cookies. This is how I came up with the cookies and creme cookie glaze. Allow the cookies to cool completely and the chocolate to set before serving, although I know it’s hard. 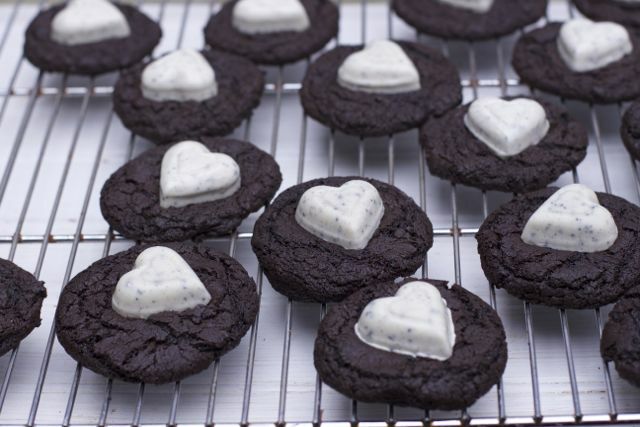 A dark chocolate cookie recipe topped with a white chocolate cookies and creme heart. Beat the butter and sugars. Add eggs, and vanilla. Blend well. Scrape bowl if needed. 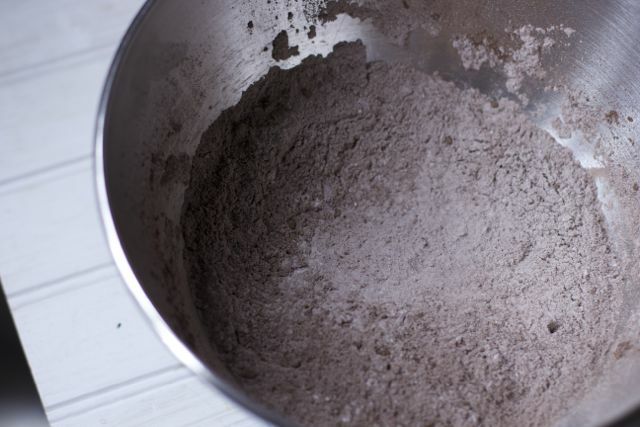 In a separate bowl, whisk the flour, cocoa, baking soda, and salt. Gradually add the dry ingredients to the wet ingredients until incorporated. Using a small ice cream scoop, scoop the cookie dough balls onto a parchment lined baking sheet. Bake at 350 degrees Fahrenheit for 9 to 10 minutes. 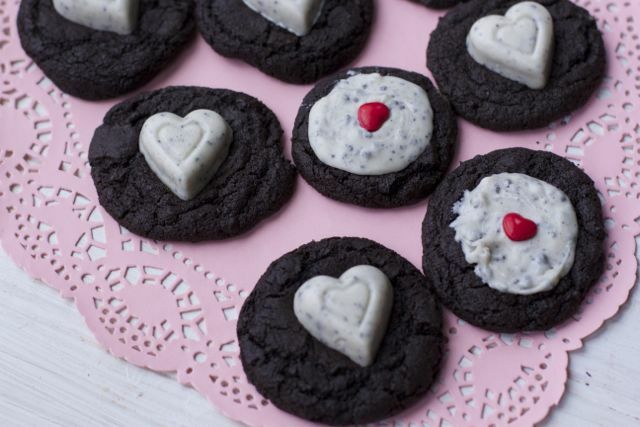 Allow cookies to rest for 30 seconds and then place a cookies and creme heart on top. Allow to cool on the baking sheet for 3 to 5 minutes before moving them to a cooling rack. If you want the glaze look, add chocolate for the last minute of baking and then spread with a knife. 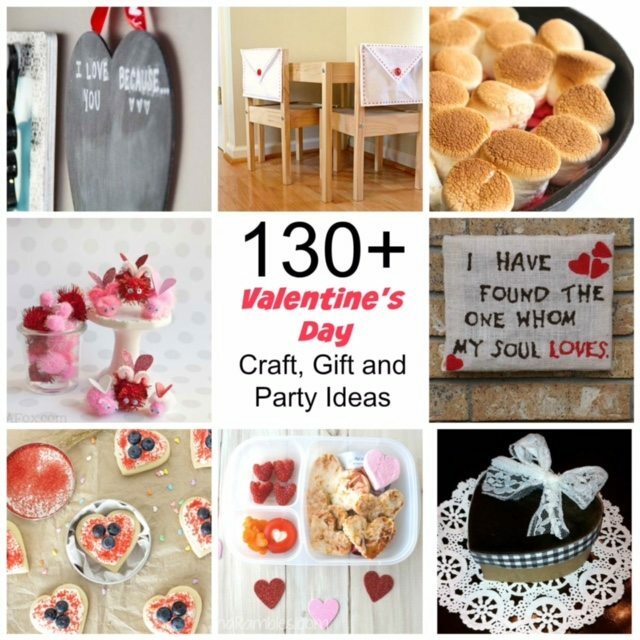 Thought you might be interested in these other Valentine’s Day Recipes and Crafts Posts. sorry you are having trouble, I will look into this. 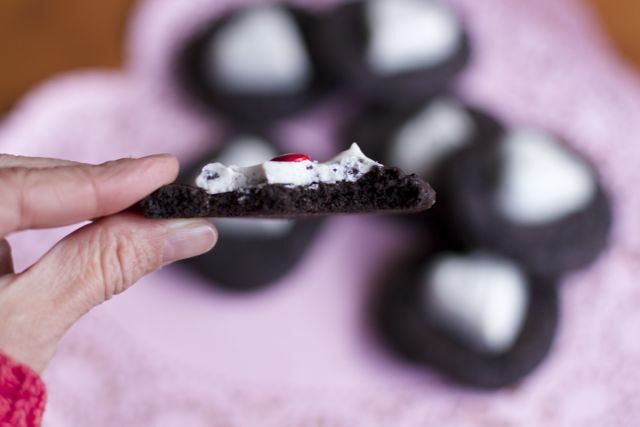 These look so good – like oreos. My kids would love to help make these and decorate them! Thanks for the fun idea. This is an adorable recipe idea. I like the way you combined some pre-made treats to make something fun and cute. What a fun treat to make for the hlidays. My kids love cookies and cream flavor too. Those cookies are so cute and I bet they taste delicious! Thanks for sharing how you make them! We are always baking something and a recipe like this would be awesome for the kids to help me with. I can’t wait to try this with them. These turned out so cute! 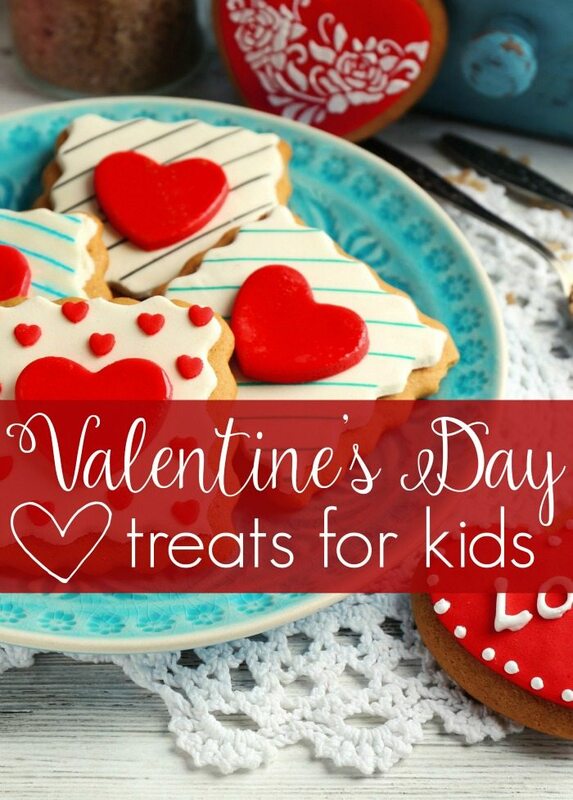 It would be a fun treat to send to school with the kids for Valentine’s day. Homemade cookies are a welcome gift on our house. These look delicious. Super cute and they look delish! I love the hearts. The combination of flavors are so yummy! I could see these in an ice cream sandwich! 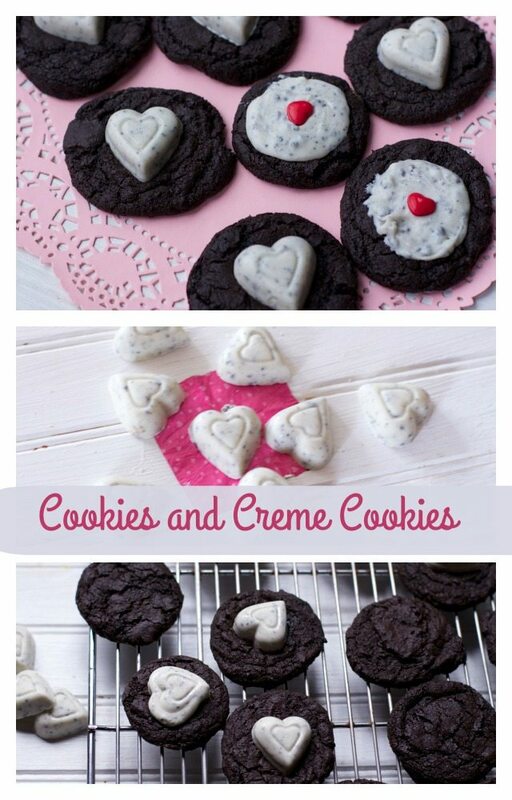 I love cookies & creme flavored treats. This recipe is simple to follow and should go over well with my family. YUM!! I do love me a good cookie and if it’s chocolate even better. I am going to “accidentally” leave this page open in hopes that my hubby sees! This recipe is just calling my name. I love cookies n creme chocolate so this cookie is just right for me. Anything that says Cookies & Creme is my thing! Oh wow! These look fun! I might make some for my son’s class! These look so tasty! I am having some girls over for a card making party, I will make these! Homemade treats are the best. These are really cute….and look very yummy!! thanks so much for pinning this. Those look so good. What a fun Valentine’s Day treat this is. I love cookies and cream! I’m pinning this recipe!